Though it may have ended sooner than he would have liked, Thomas Shaughnessy's senior season at Needham was one for the books. Photo by Eamon Convey. To cap off its MIAA Boys’ Basketball coverage, SuiteSports’ is proud to announce its award winners for the 2017-18 season. For the second consecutive season, SuiteSports’ has decided on a Player of the Year, Offensive Player of the Year, Defensive Player of the Year, Breakout Star of the Year, and Coach of the Year. These decisions were made with regular season and postseason play both being taken into consideration. SuiteSports is excited to announce Thomas Shaughnessy as our 2017-18 MIAA Boys’ Basketball Player of the Year. Shaughnessy has been the fulcrum of a Needham program that is on the rise in recent years, taking home its first South title in 2017, before winning 19 more games this season. Standing at six-foot-one, Shaughnessy brings to the court a bevy of talents including steady ball handling, consistent three-point shooting, and the strength to get to the basket at will. At the defensive end of the floor, Shaughnessy is equally as impressive using his physicality, basketball awareness, and strength to matchup with any opposing guard on the floor. Shaughnessy has also been one of the more vocal stars in Massachusetts, using his presence as the Rockets’ veteran leader to provide energy and spark his teammates performance. "Thomas consistently played at a very high level this season against excellent competition," said Needham coach Paul Liner. "Our schedule was filled with outstanding teams and Thomas filled the stat sheet on offense, defended on every play, and provided unmatched leadership, positive energy and emotion. He is a great role model for future Rocket's. A Brown commit, Shaughnessy led the Rockets to a second consecutive Bay State Carey title this year, and over three seasons guided Needham to a 57-13 record. 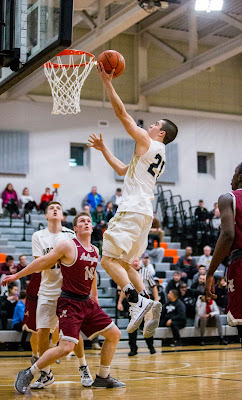 For the season, Shaughnessy averaged 21 points, four assists, and two steals per game. SuiteSports is proud to announce Alex Rivera as our 2017-18 MIAA Boys’ Basketball Offensive Player of the Year. Rivera finished his time at Lowell as the all-time leading scorer in program history, pouring in over 1,500 career points. He notched the milestone on February 18th in the Comcast Dvinci Tournament versus BC High. The most polished aspect of Rivera’s game was unquestionably his range from long distance. This was especially prevalent off the dribble, with Rivera often walking the ball up before knocking down a three-pointer from well beyond the arc. Rivera consistently used his quickness and athletic build to get into the lane, keeping defenders on their heels with his ability to drive into the middle before pulling up with his knock down mid-range game. Rivera, who will continue his playing career at the University of Massachusetts-Lowell next season, finished the year averaging 25 points, six rebounds, and five assists per game. Throughout Mansfield’s run to the state tournament, it found itself up against one of the top players in Massachusetts on a nightly basis. In order to navigate a relentless Division 1 field, the Hornets had to face the likes of BC High’s Travis Evee, Newton North’s Ethan Wright, Everett’s Ghared Boyce, and Franklin’s Chris Edgehill. Every time, however, Mansfield had a player who was more than up to the challenge in Sam Hyland. Hyland was the Hornets’ top defensive option throughout the second half of the season, preventing each opponents' star player from taking over a game in its closing moments. While he was often not as athletic or quick as his matchup, Hyland made sure to take advantage of thorough scouting reports to pick out subtle flaws in their skillset, or pick up on their tendencies and habits. “He wanted the challenge of covering the other team’s best player and covering the best players in the state,” said Mansfield Associate Head Coach Bobby Introini. “In most cases he wasn’t the best athlete in the matchup, but his attention to detail and basketball IQ are off the charts. Ranking near the top of his class academically, Hyland will attend Boston College in the fall. After gaining traction as a sophomore, Belmont’s Danny Yardemian firmly established himself as a star in his junior campaign. Yardemian led the Marauders to a 17-6 record and a spot in the Division 2 North semifinal, as Belmont won 11 of its last 12 games before falling to Woburn in the tournament. An above average ball handler who gets into the lane with ease, Yardemian was the steward of Belmont’s offense. Throughout the season, Yardemian developed a consistent jump shot, showcasing an ability to dribble penetrate before pulling up and knocking down from 15-feet away. When Yardemian became the opposing defense’s focal point, he turned into a high-level facilitator, averaging seven assists a night. Yardemian scored 556 total points and averaged 23 points per game. SuiteSports is proud to announce Mansfield’s Mike Vaughan as our 2017-18 MIAA Boys’ Basketball Coach of the Year. Despite not returning a single starter from last season, Vaughan’s unit did not skip a beat, once again ascending to the top of the Division 1 South field by regular season’s end. In what has been a run of sustained excellence, Vaughan's 14th season at the helm proved to be his best. The Hornets took home their eighth Hockomock Kelly-Rex league title over his tenure, third South title, and claimed their first state championship in program history. Come March, the Hornets hit their stride, meticulously and efficiently defeating their opponents one at a time. Over the course of its six-playoff games, Mansfield not only never trailed in the second half, but also was only in a one-possession game in the second half for a combined total of 14 seconds . Vaughan's unit won 20 in a row to close the season. Mansfield's offense worked flawlessly, using its combination of cutters, screeners, and constant ball movement to seemingly always find a player open for a clean look. For the tournament, Mansfield shot over 45-percnet from the field. Vaughan's players were equally as impressive on the defensive end of the floor, showing an impressive ability to rebound despite often being undersized. For the tournament, the Hornets had a net plus-28 advantage on the glass. Over the last six seasons, Mansfield has totaled a 139-19 record, good for an astounding .880 winning percentage.